Your first activity for the week is to read about the Southern Colonial Region. 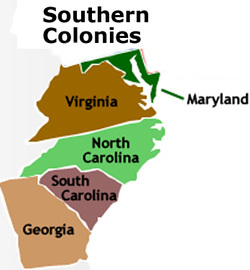 The Southern Colonies include Maryland, Virginia, North Carolina, South Carolina, and Georgia. In the reading you will be learning more about the colonies of Maryland and Georgia. Click on the picture to the right to get started. The reading will open up in a new page. What it would be like to live in the Southern Colonies? What type of economy, geography, climate, and government did the Southern Colonies have? Watch the video to the right to learn more about the Southern Colonies. What is the Mason-Dixon Line? What was the very first settlement in North America and what colony was it in? Who was responsible to founding Maryland and why? How do the Carolinas begin? What are the two main reasons Georgia was founded? Next, you will be viewing a slideshow about the Southern Colonies. The slideshow will give you more information about the plantations, farms, family life, slavery, and American Indian culture of the colonies in the Southern region. Click on the arrows at the bottom of the slide to start viewing. For this lesson's blog post you will be writing about what it would be like to live in a Southern Colony. Imagine you are a colonist living in one of the Southern Colonies. What was your life like? What did you believe? What did you do to make a living? Give me a detailed description of what life in the Southern Colonies was like. Remember, your entry should be in paragraph form, including complete sentences and correct punctuation, spelling, and grammar. Why did you come to live in the Southern region? What were you looking for or hoping for? What was the environment like? Think about the geography and climate of the Southern region. What types of jobs might you have living in one of the Southern Colonies? Living in a Southern Colony, what type of religion might you be apart of and what are our religious beliefs? What was the government like in the Southern Colonies? Was it different or similar in each colony? Could you vote or be apart of making laws? Take the online quiz to show what you have learned about the Southern Colonies. Make sure to put your first name and last initial, so you get credit for completing the quiz. Choose the best answer for each question. When you are finished, press the Submit button at the bottom. If you have extra time go ahead and check out these websites to learn more about the Southern Colonies. Learn more info about the Southern Region. Check out a timeline of the Southern Colonies. Look at this Glogster about the Southern Colonies.